I wish there was breakfast delivery. You would wake up in the morning, and your breakfast would be dropped off at the door. Or perhaps served to you in bed. I must still be dreaming. Regardless, when the breakfast delivery failed and my refrigerator proved to be empty, I turned to the box of matzo leftover from Passover. I pulled out a single sheet of this unleavened bread and broke it in half. Both sides got smeared with cream cheese. The savory-to-be-matzo was topped with thinly sliced tomato, cucumber, salt, pepper and the last sprigs of summer basil plant. 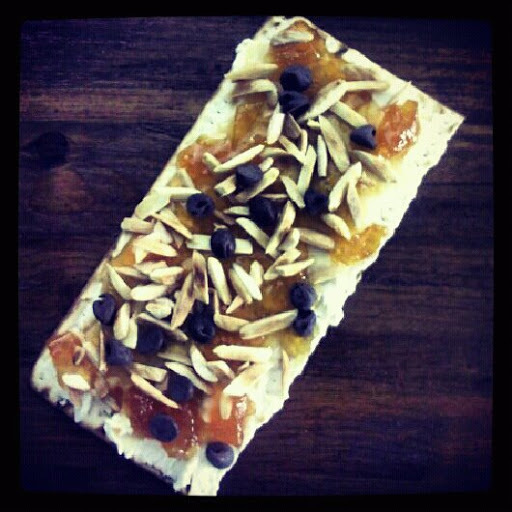 The sweet matzo was spread with apricot jam, sprinkled with toasted slivered almonds and a handful of chocolate chips. Who said breakfast had to be hard? 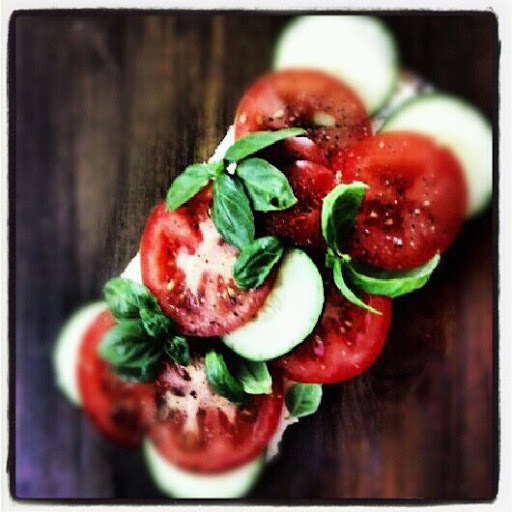 I really like the tomato/mozzarella photo!! Fantastic. Glad you were able to pull breakfast together. And, in such a tasty looking way.